Smart-UPS TM On-Line provides high-density, double-conversion online power protection for servers, voice/data networks, medical labs, and light industrial applications. The Smart-UPS On-Line is capable of supporting loads from 1 kVA to 10 kVA in a rack/tower convertible chassis. The 6 kVA, 8 kVA, and 10 kVA models feature unity output power factor enabling them to support power-hungry blade servers or heavily loaded equipment racks. When business-critical systems require runtime in hours, not minutes, Smart-UPS On-Line can be configured with multiple battery packs to meet aggressive runtime demands. The included PowerChute TM Network Shutdown management software provides unattended graceful shutdown of network operating systems. Models 5 kVA to 10 kVA include an integrated network management card for remote management. The entire Smart-UPS On-Line family helps to provide value to customers with demanding power conditions, including a very wide input voltage window, extremely tight output voltage regulation, frequency regulation, internal bypass, and input power factor correction. Predicitive failure notification Provides early-warning fault analysis ensuring proactive component replacement. 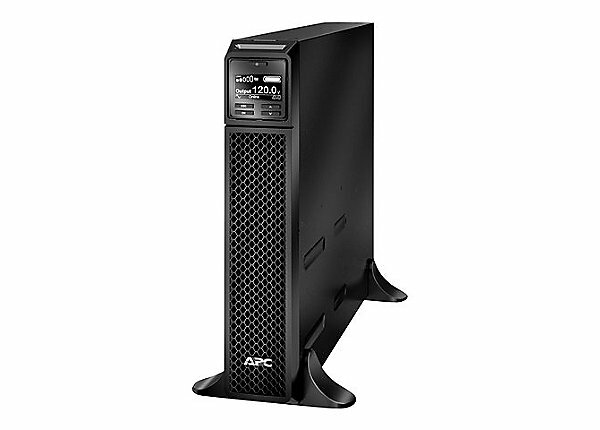 Download the APC Smart-UPS On-Line 120/208 V Data Sheet (PDF).